This pioneer log cabin, originally located on a 160 acre plot in southwest Ripley County that was owned by George and Sally Patterson, was probably constructed between 1865 and 1867. The cabin remained in the family for many years and was known as the George Patterson cabin. It is a classic example of the sturdy and practical home style that was used throughout our whole western frontier. On December 17, 1921, J.C. Harman and his wife Martha E. purchased the property from the widow Missouri Patterson and moved into the cabin. Their son Percy and his wife Opal Gibson Harman lived in the cabin from 1927 to 1932. Their first daughter, Jewell (Mrs. Arvel Braschler) was an infant when they moved to the cabin in 1927. Daughters Georgia H. Pierce and Ruth H. Schroeder were both born there. J.C. and Martha moved back into the cabin in 1932 and lived there until 1947 when they sold the property to the Weston family and moved to Doniphan. Roy Lee and Geneva Gibson were the next owners and they rented it to Al and Glayds Emmery, the last known inhabitants of the cabin. Following the Gibsons, other owners were Robert and Dixie Tate, Willie and Pauline Morgan, Rusty and Marilyn Rawlings and Ron and Sue Smith who donated the cabin to the Pioneer Heritage Homestead Project. The Homestead was dedicated on July 5, 1997. 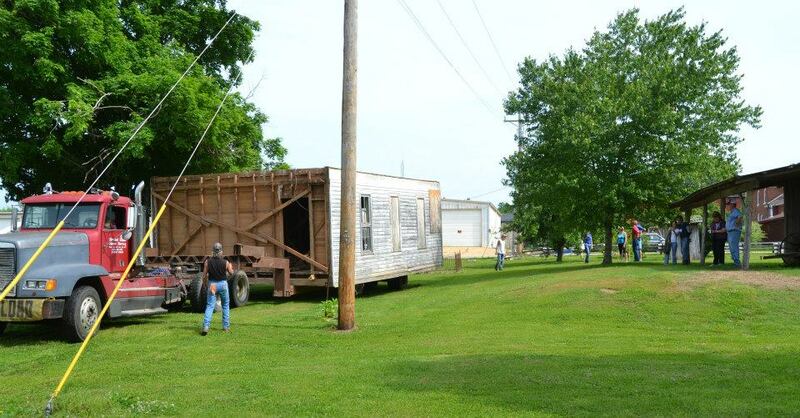 The Plunk School building arrived in June, 2014 after a fund raising campaign by the Doniphan Neighborhood Assistance Program (DNAP) and the Ripley County Historical Society. Repairs to the windows and doors and a new walkway and front and back porches are still under construction. This turn-of-the century log barn was moved to the Heritage Homestead from Carter County and restored. It is a typical log barn built from hewn pine logs and added to as materials became available. This barn was probably built by the Gunn family, since the land on which it stood was owned by them between 1894 and 1904. The barn was donated by the Claude and Gertie Kennedy family and brought to Doniphan by Lester Wright. Other families owning the property included Cosgrove, Grown, Hooper, Hannah, Lowe, Skinner, Shockley and Fetterman. The Barn at the Heritage Homestead now houses a display of early farm machinery and equipment. It also provides shelter for local events such as Heritage Days which are held at the Homestead. Annual two-day festival filled with live music, storytelling, living history exhibits and pioneer life demonstrations of rail splitting, fiddle making, blacksmithing, quilting and other vintage crafts. The 14th annual Heritage Days event will take place April 12-13, 2019. Vendors and crafters who would like to participate can contact the Curator at the Heritage Museum 573-996-5298 for information on registration and fees.